This attractive looking monitor is another great addition to an ever growing array of monitors from ASUS. It isn’t branded as a gaming monitor but it is well sized quality. Whilst it has high end appeal it has a decent price point. The Asus Designo MX259H is a 25″ monitor backed by a fantastic IPS panel. The 25″ size is great for anyone looking for something bigger than the 23″ size that many of us will be currently using but who don’t really like the idea of a massive 27″ monster sat a few inches away on their desk. 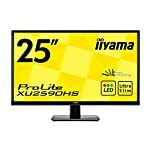 The MX259H is a 1080p HD screen which still looks good at this size, the 25 inch form is where you might want to start thinking about higher resolutions such as 1440p, but it is by no means a requirement. You can spend less, get the bigger size, and still get a stunning image. There aren’t many option in the 25″ size bracket so it’s great to see such a beautiful monitor available in this form factor. You’ll notice that it has an edge to edge design with near zero frames (0.8 mm) , it’s thin too – just 15mm an it’s thinnest point! Great if you need to push your monitor right up to the back of your desk. Buttons to control the usual settings are on the bottom right hand side of the monitor, there are speakers on the sides. The ports are around the back but are accessible enough, note that it only has HDMI connectivity. The stand might not appear solid on first impressions but actually it is a sturdy piece of aluminium that supports the screen just fine. The screen is coated in an anti-glare material which will improve your viewing experience, giving you a clear view even an angles. The IPS panel ensures you get a good 178 degrees of effective viewing so no need to worry about poor images when glancing side on. ASUS have put some effort into the audio capabilities by teaming up with Bang and Olufsen ICEpower to include “SonicMaster” technology. Whilst I wouldn’t expect the quality afforded by a proper external audio system, if you are looking for better than average speaker performance from your monitor, this should meet your requirements. An IPS panel should always give you a clearer more immersive image compared to an equivalent TN based kit. However the trade off can be on response times. 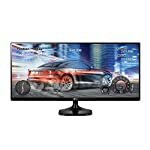 As we are specifically looking for gaming monitors here this might be cause for concern however with a 5ms response time you can still game with minimal ghosting or blurring. Note that you don’t get adaptive sync technologies here so depending on your setup tearing could be a problem. You’ll get vibrant colours, deep blacks and bright whites thanks to ASUS Smart Contrast Ratio of 80000000:1. 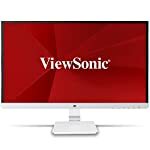 This is a 1080p full HD monitor so you should get good frame rates out of this even when powered by an entry level graphics card such as the Nvidia GeForce GTX950. This resolution still holds up OK on a 25″ screen but many rivals at this size are opting for 1440p. Of course you’ll need a much beefier graphics card to play games at this higher resolution so it still makes sense to consider 1080, you’ll save some money too. We give the Asus Designo MX259H a 4.5 out of 5 rating. Want to know what existing owners of the monitor think? You can read real user reviews here. Should I buy the Asus Designo MX259H?